Cabanas is one of Paraguay's most highly-rated players and was part of their World Cup squad in Germany four years ago. (CNN) -- Paraguay international Salvador Cabanas is in a critical condition after being shot in the head in Mexico City. The 29-year-old Club America striker was taken to a hospital intensive care unit following the incident on Sunday night. Mexico City attorney general Miguel Angel Mancera told TV station Televisa: "We don't know the motive behind the injury. According to an initial report it was a shot from a firearm with a frontal entry point and without exit. "The player is conscious but he has a heart problem which they're trying to stabilize. We're waiting to see what those arrested have to say. It seems that the attack happened in the bathroom of a bar." Cabanas is one of Paraguay's most highly-rated players and was part of their World Cup squad in Germany. 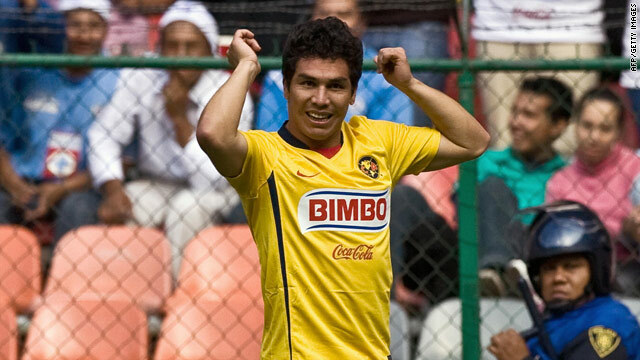 He has scored more than 100 times in the Mexican top-flight and has netted 18 goals in 24 matches this season. Club America president Michel Bauer later revealed the forward was having surgery adding he believed the attack was unprovoked. "He arrived conscious and responded well to the questions they asked him as he was going into hospital," he told Televisa. "It's a key point that can be encouraging, but until further notice we cannot speculate on anything at all. "They wanted to assault him. I can confirm that is what his wife has said, that it was an assault. There was no shoot-out nor any quarrel," Bauer added.